Raspberries are among the top fruit sources of fiber and offer a wealth of vitamins and minerals. The pesky seeds that get stuck in your teeth don't account for much of that fiber, so you can lose the seeds without losing the fiber. Understanding the importance of dietary fiber, as well as how to incorporate raspberries into your diet, may help you increase your daily intake. Fiber is the part of carbohydrate foods that cannot be digested. When you eat fiber-rich foods, the fiber passes through your digestive system intact, which has several important health benefits. Seedless raspberries have an abundance of dietary fiber. A cup can give you 30 to 35 grams of fiber. One of the best-known benefits of eating fiber is your decreased risk of constipation. Fiber helps keep your digestive system working properly so waste is eliminated efficiently. Eating more fiber may also reduce your risk of chronic health problems. The Harvard School of Public Health reports that a fiber-rich diet may lower your risk of developing heart disease, Type 2 diabetes and cancer. A diet that includes sufficient amounts of fiber may also help you lower your cholesterol, keep your blood sugar stable and lose or maintain your weight. Raspberries are one of the top fruit sources of fiber. One cup of raspberries, with or without seeds, has about 8 g of fiber. Eating 1 cup of raspberries supplies you with more fiber than some of the most popular fiber-rich fruits. 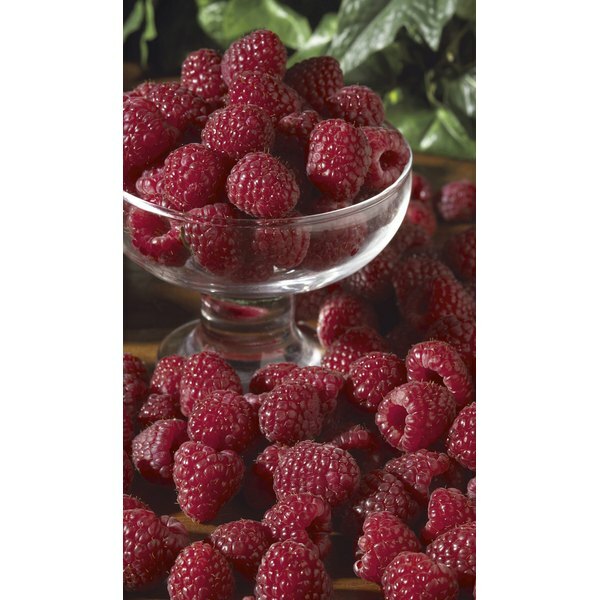 A serving of raspberries has more fiber than a serving of apples, pears, bananas, kiwifruit, dates or figs. Seedless raspberries are tasty on their own, but you can include them in a variety of recipes and meals to help you increase your fiber intake. Scatter a cup of raspberries on top of your bowl of breakfast cereal or oatmeal. Stir fresh raspberries into a carton of yogurt, or use them to top a bowl of frozen yogurt. Seedless raspberries can also be added to bread and muffin recipes and used to make a fiber-rich jam. Add raspberries to a fruit salad to increase the fiber content. Saute your seedless raspberries slightly, and use them as a healthy topping for grilled chicken or pork chops. Do Apples Help You Lose Weight?